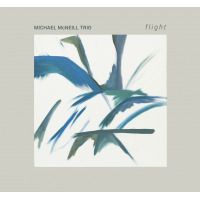 Michael McNeill's debut as a leader introduces a fresh perspective to the popular piano trio format. His compositions don't progress in a linear manner, nor do they strive to settle on time-tested harmonic or rhythmic structures; instead, they insistently explore the sonic possibilities within the immediate, fragile and equal interplay that the Buffalo, NY-based pianist-composer has with his improvisation-experienced trio mates, double bassist Ken Filiano and drummer Phil Haynes. McNeill has a mature, personal voice, developed through a wide range of experiences, including with trumpeter Maynard Ferguson alumnus, baritone saxophonist Bruce Johnstone, and crossover ensembles led by percussionist Ravi Padmanabha. His compositions apply open-ended, jazz-based improvisational techniques to the format of the Indian raga. After sketching the skeletal lines of a composition, the trio patiently explores its various aspects both simultaneously and separately, until reaching a common climax. The twenty-minute opening, "Hold On," stresses this approach. Filiano creates tense interplay with his confident, reserved arco work, amidst fractured rhythmic patterns and spare piano lines. Later, McNeill lessens this tension with an impressionistic solo that is transformed into a conventional yet fiery trio improvisation with a clear chord progression that concludes when Filiano, once again, leads with arco solo. "Nobody's Waltz," "PreludeMetropolis" and "Exit Now" have even looser structures, their progression shifting according to the immediate articulations of all three musicians without an attempt to tie them into any obvious pattern. This approach demand fast thinking and a rich musical language that allows the trio to color the material with imagination and passion, encompassing these free form abstractions within a cohesive envelope. Only the closing "I'm OK Now" follows a touching melodic theme, delivered in a beautiful and elegant manner. McNeill is an exceptional composer and player, with a debut that sets a high standard for those yet to come. Track Listing: Hold On; Nobody's Waltz; Prelude - Metropolis; Exit Now; I'm OK Now. 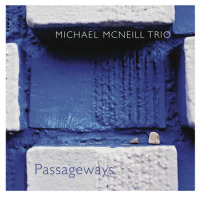 Personnel: Michael McNeill: piano; Ken Filiano: bass; Phil Haynes: drums.